Many travel to finger to save money but to hitchhike or to hitchhike involves much more than that: it is a perfect opportunity to get in touch with local people, to corroborate that the good far outnumber the bad and knowing another look about some of the current issues. Thus, with a sign that indicates our destiny, the raised thumb, good presence and a smile on the face we can do thousands of kilometers enjoying the company of someone we do not know, but who in a few minutes can become a great friend of the path. Many people believe that it is not safe to travel this way in Latin American countries, like Peru , but our experiences have always been very positive. 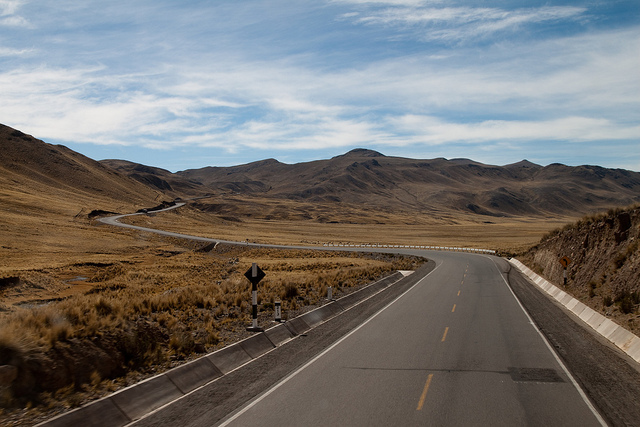 The Peruvians with whom we met on the road were always very kind to us and helped us more than they could. In these cases, as in many aspects of life, one has to let go of his intuition: if we approach a vehicle and we sense that something is not right with the driver, we thank and wait for the next one. In addition, hitchhiking has a share of uncertainty that gives the trip a special seasoning. You never know who is driving and what that trip can end. During our time in Peru we lived very nice stories . We share two of them and invite you to visit this beautiful and surprising country by the hand, or rather, “at the wheel”, of its inhabitants. We were in Nazca and we wanted to get to Arequipa. As we walked along the side of the road to one of the service stations to start hitchhiking, it occurred to me to turn around. I looked back and saw a truck coming. When he passed close to me I made a finger. Actually, I did not have much hope that it would stop, since it was not the best place to do it and the driver was coming at a road speed. But raising the arm and putting the fingers in position did not cost anything. So I tried. The truck passed by. We kept walking. A few seconds later, when I look ahead I see that the truck stops. Had he stopped for us? We asked ourselves. We hurried the step and yes, it had stopped for us! I never saw a truck interior as clean, broad and careful as Marcos’ . Marcos received us with a huge smile, asked us to take off our shoes and invited us to enter “his house”. Is that they spend so many hours in the truck that they feel like their home. Marcos’ truck had two comfortable armchairs, a refrigerator, a television to watch movies during breaks, two large bunk beds and space to store belongings. But also, I had something that surprised me: mate, sugar and a thermos with hot water. “It’s the gift of a friend from Argentina, I always carry it with me and I take it,” he told us in front of my astonished face. But not only we talked about how to prepare a mate, but thanks to Marcos we also knew the origin of the food chifa (half Peruvian, half Chinese). The trip of more than 12 hours was very enjoyable: we talked a lot, we listened to music and we enjoyed incredible coastal landscapes: very high dunes, a turquoise sea whose waves beat strongly against the coast and valleys of crops with green tones on the banks of rivers . A landscape to enjoy. Traveling by finger in Peru is an experience that we recommend you to learn about Peruvian kindness and enjoy interesting stories . PS: One of the issues to take into account when making a finger is to know the specific vocabulary of each country. For example, in Argentina we call the “service station” the place that in Peru they know as “grifo”.